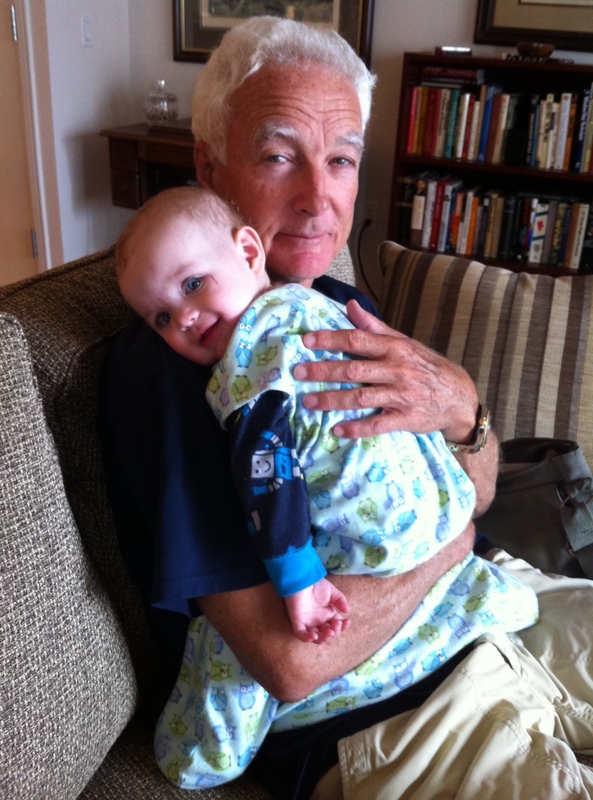 You at 13 months, snuggling with Grandpa Charlie. Lately your dad and I have been finishing each day by telling each other what we’re grateful for. We’ve only been doing it a couple of days, but so far I love it. Feeling grateful makes me feel happy. It makes me feel loved. It makes me feel like anything is possible. One of the things I am most grateful for, of course, is you. Today you are thirteen months old. Thirteen months! I thought I’d take a moment to tell you about some of the times over this last year with you that I’m grateful for. The first one goes back to the very first day you were born. After you swooshed out like a speeding bullet, they tried to put you on my chest, but they couldn’t because the cord was too short. I felt your weight on me for just a second before they cut the cord and whisked you to the other side of the room. You cried the whole time you were being weighed and tested. Then, at last, they put you on my chest. And you stopped crying. Instantly. You just chilled there, looking around the room, taking everything in. Our doula even commented that she had never seen a freshly born baby that calm. The amazing thing is that you are still like that. Almost always, if you’re crying or upset about something, you calm when I take you into my arms. I am so grateful for this bond that we share, grateful for whatever it is between us that makes you feel safe. Another time that comes to mind is Christmas Eve. You were just five months old then. You, your dad and me had trekked up to Vermont a couple of days earlier to spend the holiday with Grandpa Charlie. It was our first Christmas without Grandma Peggy. I don’t think any of us knew how it would go. We all sat together after dinner and read you The Polar Express. It was a long book for a little baby, but you sat through the whole thing and actually seemed interested in it. The couch we were sitting on was soft, I could see the lights from the tree out of the corner of my eye, and there you were, all snuggled up on our laps. And you know that? Somehow Christmas was still magical, even despite all of the loss we felt. That was mostly because of you. Then there’s the moment you decided that you love cats. Admittedly, I don’t remember the exact day, but it wasn’t too long ago. You just up and decided that cats were the best thing ever. Every time you see one you scream like a screech owl, giggle and generally act like a lunatic. Your joy at seeing something as simple as a cat—something that I see all the time and don’t give a passing thought to—makes me feel joy. I start to see the world through your eyes and what I see is incredible. Cats? Awesome! A red block? Awesome! Random people on the street? So incredibly awesome! Those are just three of the zillions of moments with you that I’m grateful for. I’m grateful for you every single day. It’s hard to stay sad or anxious or angry when I see your smile. I always tell your dad that I’m not sure how wars are still going on when there are baby smiles in the world. So thank you, Fish Face, for coming into my life. And thank you for being the craziest, screechiest, sweetest, best little girl there ever was. Here’s to one great year, and many more to come. 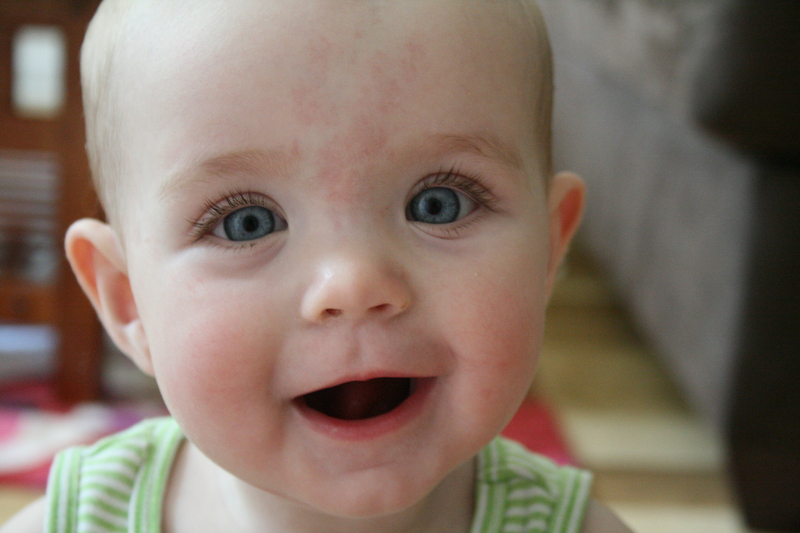 Babies: creating world peace, one smile at a time.